2-time NBA All-Star, Serial Entrepreneur and Master Connector, Baron Davis presented The BIG (Business Inside the Game) Power Summit events during NBA All-Star Weekend in Los Angeles February 14, 2018 – February 18, 2018. The Summit began with the BIG LOVEFEST Valentine’s Day Women’s Networking Luncheon hosted by ESPN Sports Center Anchor, Cari Champion (pictured above) and sounds by DJ, television personality, and fashion model DJ KISS. The event honored women in business, sports, and entertainment including motivating speeches by Los Angeles Sparks President/COO, Christine Simmons, ESPN Sports Center Host. Attendees include actress Sophia Bush, ESPN’s Jemele Hill (pictured below), and Celebrity Chef Nikki Shaw, among others. 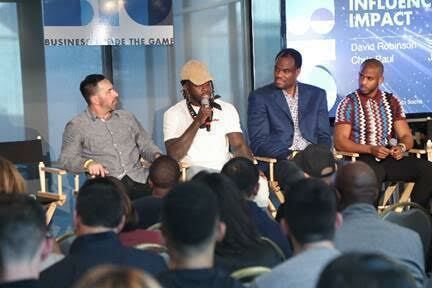 Attendees include: Ice Cube, Retired NBA Champion Matt Barnes, executive producer of VH-1′s reality TV series, Basketball Wives, Shaunie O’Neal, Lil Wayne’s manager/Maverick Management, Cortez Bryant (Young Money), retired NBA player Amare Stoudemire, NBA “super fan” James Goldstein, and two-time NBA All-Star MVP, Allen Iverson. Panel attendees were treated to thought leadership at the highest level brought together to exchange future-forward ideas around how to create real business and social impact, collaborations and opportunities that live at the intersection of sports, media, technology and culture, disrupting industries, and enriching our communities. Panelists include: Rapper, Actor, Producer, ICE CUBE, NBA All-Stars Chris Paul and NBA Hall-Of-Famer David Robinson, Co-founder and President of Lyft, John Zimmer, Venture Capitalist and Impact Investor Robert V. Smith, Billionaire Financier and Philanthropist Gary Winnick and others. A viewing party of NBA All-Star televised events immediately followed the panel. Additional panelists include: Film Producer Scott Budnick, Philadelphia Eagles, NFL Super Bowl Champion Jay Ajayi, and Passionflix CEO, Tosca Musk (sister of Elon Musk). Venture Capitalist and Impact Investor Robert V. Smith, Billionaire Financier and Philanthropist Gary Winnick with Baron Davis.